Assassin's Creed Exec Accuses Game Journalists of "Subtle Racism"
The creative director of Assassin's Creed III thinks Japanese games are favored despite "gibberish" stories. While some gaming franchises release yearly installments without major complaints from the industry, the Assassin's Creed series hasn't been so lucky. 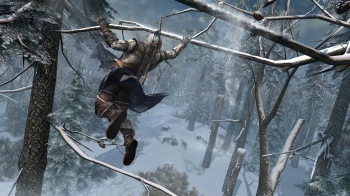 Assassin's Creed III Creative Director Alex Hutchinson feels that some people unfairly questioned the series' ability to maintain quality in yearly releases, stating in a recent interview, "We were reading reviews about Revelations and a few people were asking whether this was the end of the franchise." When asked why Nintendo could get away with yearly installments while Revelations was criticized, Hutchinson stated, "I think there's a subtle racism in the business, especially on the journalists' side, where Japanese developers are forgiven for doing what they do." Hutchinson accused game journalists of praising Japanese games for stories that are "literally gibberish," adding, "then Gears of War comes out and apparently it's the worst written narrative in a game ever. I'll take Gears of War over Bayonetta any time." Hutchinson wants games to be based on whether or not their narratives are "any good," but that's entirely subjective--what's "gibberish" to one person could be fantastic to another. And of course, Japanese games aren't exempt from criticism, either. While Revelations was generally reviewed less favorably than Assassin's Creed II or Brotherhood, it still has a Metacritic review average of 80, so it appears that gamers and reviewers are still enjoying the series despite yearly game releases.